воскресенье, 11 января 2009 г.
производства сыра и другой молочной продукции. вторник, 6 января 2009 г. Currently, during the "Renaissance" of Turkmenistan, thanks to our President, Mr. Gurbanguly Berdymukhammedov Myalikgulyevichu and the Government of Turkmenistan, our market is open for cooperation in all fields of science, business, culture, arts, sports, etc. We in turn offer you cooperate with us! 120 dollars, 100 euros, 100 British pounds sterling or 3000 Russian rubles. For Post (preferably to the safety of using express mail) send catalogs, at which we let. To put catalogs also handout on plain paper in the number 100 - 150 pieces. 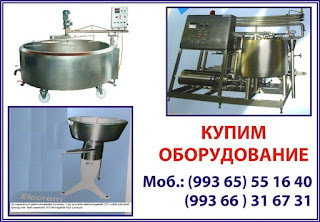 On a separate sheet power of attorney for my name to the right part of the Organization of Turkmenistan and offer your products and services to your catalogs and materials. Also, a contract in two copies (one of whom, after signing We'll send you back) for further cooperation, on your terms. We accept any conditions for cooperation if they do not address the political, religious themes and do not affect the copyrights of "third parties". For you have other or their proposals for cooperation, if you can be interesting Turkmenistan, please inform. All your materials or correspondence can occur at any convenient for you language. We would be happy to cooperate. Your future "representative" in Turkmenistan!